A self-proclaimed young adult fiction addict, TC finds the passion in which young people experience life to be contagious. That passion is the driving force of her writing. My journey in writing began at a young with the love of poetry. I won my first poetry contest in third grade and had my picture taken for the paper. It was a pretty big deal. Thinking back over my childhood, I realized that my mind was always geared to be a writer. My imagination stirred up interesting plots and characters even in play time. As an adult, writing became my escape from reality. There’s nothing like getting lost in story I’m writing. I shared stories with my family and eventually began to write children’s stories for my class. I decided to give a try at publishing one of the children’s stories I wrote. It was published, and the feeling of seeing my characters come to life was unbelievable. Unfortunately, I was naïve in the world of publishing and didn’t have a positive experience. Lesson learned, I did my homework when I decided to take the step into publishing of my young adult novella. I found a critique partner and paid someone to professionally edit it before I submitted it to small independent publisher, Clean Reads, former name Astraea Press. I was sent me book contract and Beyond Vica was published six months later. Last November I took on the challenge of NaNoWrMo. A challenge it was! In order to try and reach the goal of writing 50,000 words in a month, I had to get up at four thirty each morning to write before school started. I didn’t make the goal by the end of the month, but managed to hammer out 43,000 words. I finished up the novel in December, had it edited and submitted it to Stephanie at Clean Reads in February. My first young adult novel, To Be Honest, came out in July of this year. I’m very grateful for Stephanie and all of the support at Clean Reads. Publishing with Clean Reads has been positive and professional in comparison to my first experience. I publish my children’s story of Kindle after my contract was up with the first publisher and haven’t pursued anything further with children’s book writing. Right now, I feel my niche is young adult contemporary fiction. The topics I choose to center the stories around are relevant to young people today. I absolutely love to create the characters. There is nothing like seeing your work published and characters come to life. I’m truly blessed to be able to pursue my passion. 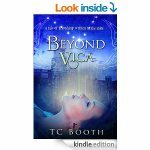 This entry was posted in Spotlight Authors and tagged Beyond Vica, My Writing Journey, TC Booth, To Be Honest. Bookmark the permalink. Better late than never. My entire critique team is doing NaNo this year. I guess I’ll have to provide the rah-rah support since a busy work life prevents me from participating this year. I’ve heard so much about it; I’ll have to try it one year. Rebecca it (NaNo) is an interesting concept. I’ve never had the pleasure of signing up for one. Its a good motivator. Something I’m lacking. lol Thanks for visiting and supporting Tammi. Congratulations, Tammi! You are truly worthy to stand in this sacred Spotlight! Shirley, thank you for hosting. Your support of indie authors and RRBC members is appreciated. Beem thank you for being here and for acknowledging my efforts to support RRBC. I appreciate you too. Tammi, sorry that I’m just catching up to your tour now. I’m enjoying learning more about you as a fellow-educator and I’m sure we’ll have a great chat on Thursday! Have a wonderful tour! Thanks for hosting Shirley! You are so welcome John. Glad you made it here to support Tammi. Well John, you’re so busy. You can’t be in two places at once. We need to clone you. Thanks for stopping by. I know Tammi appreciates it. Hi Tammi! It was nice to learn more about you! Are you doing NaNoWriMo 2015? Thanks Shirley for hosting! Glad you stopped by Christa! Tammi, I am excited the world is going to have the chance to get to know you through your reign as RRBC Spotlight Author! Thank you for sharing your story. Thank you, Shirley, for hosting! Becky we appreciate your support of Tammi. Sounds like you know something we don’t. Glad we’re going to get the chance to find out. Hi Tammi and welcome to my blog. I hope your spotlight is going well in spite of my blunder. lol Enjoy your day!